After contracting 4.94% in 2009, Oregon’s real GDP grew 3.43% in 2010, which ranked 8th best among all states plus D.C.
Over the past decade, Oregon’s real per capita GDP grew 23.2%, which ranked 5th best among all states plus D.C. 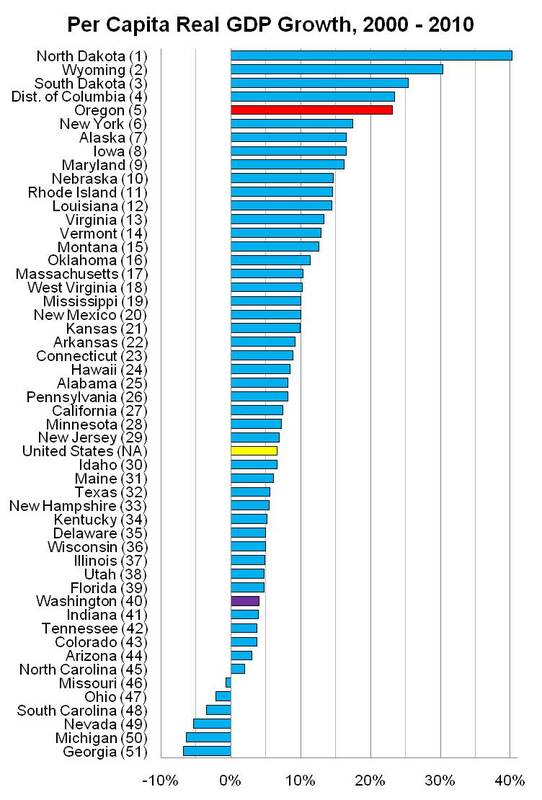 This morning, the U.S. Bureau of Economic Analysis (BEA) released its advanced estimates for 2010 GDP by State, along with revisions to the 2007-2009 estimates. The release included nominal, real and per capita GDP figures for each state and region. Overall, 48 states plus the District of Columbia experienced positive growth in 2010, after 40 states plus D.C. contracted in 2009. 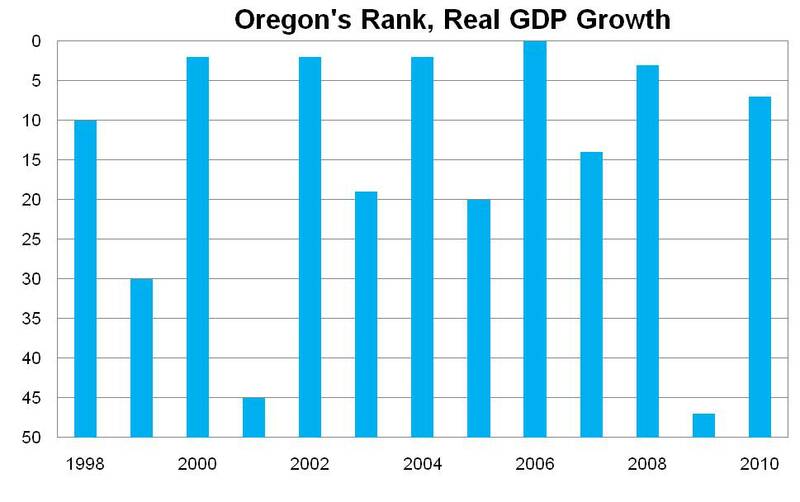 U.S. real GDP in 2010 grew 2.55 percent, while Oregon’s real GDP grew 3.43 percent. Oregon’s growth in 2010 ranked as the 8th fastest growth among the 50 states plus D.C. 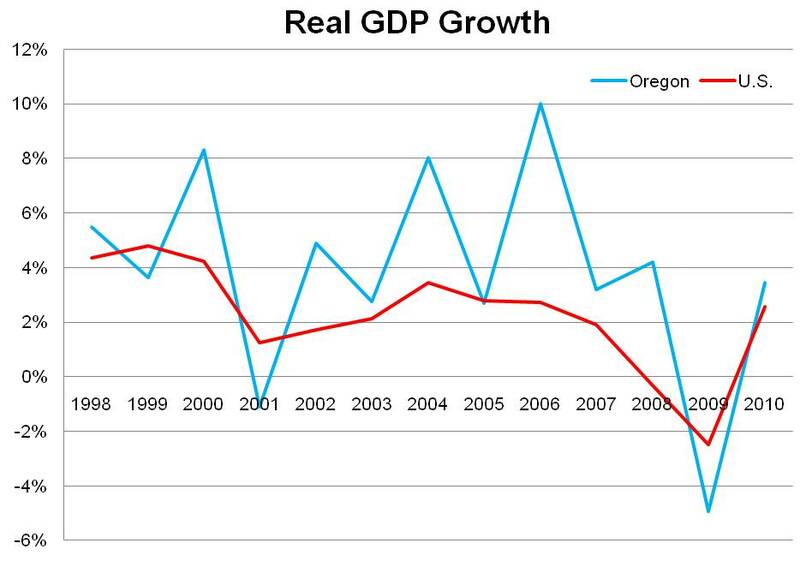 Given Oregon’s economy is more volatile than the nation as a whole, real GDP growth consistently outperforms the U.S. growth during expansions and declines further during recessions, as shown in the graph below. Oregon’s relative rank among all states plus D.C. follows a similar pattern. After the state’s real GDP contracted 4.94 percent in 2009, which ranked 48th best or 4th worst, Oregon’s growth in 2010 is again among the top 10 states. Note that in the following graph 1 represents the fastest growth, while 50 represents the slowest growth. The table below highlights the percent changes for select industries. Fully detailed industry data is not yet available for 2010; the BEA will update as new information becomes available. While nearly all industries follow the pattern of declining in 2009 and expanding in 2010, in terms of the contribution to state GDP, the Durable Good Manufacturing sector remains king, particularly the computer and electronic manufacturing sub-sector. 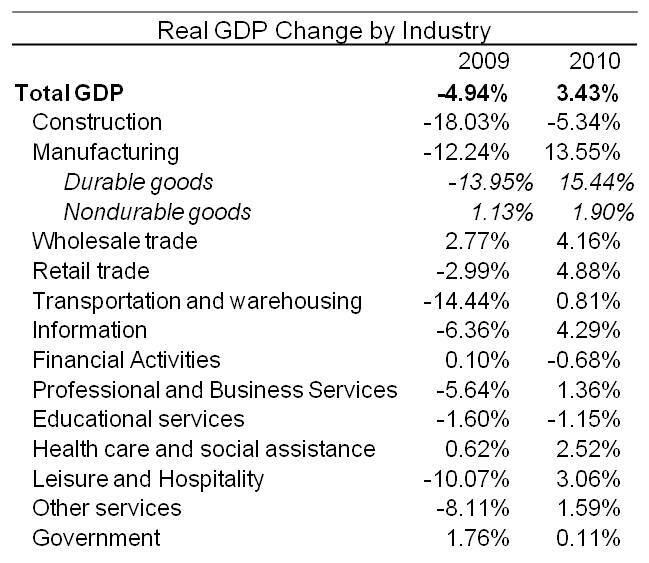 If one were to sum all industries except Durable Goods Manufacturing, the state’s real GDP would have declined only 2.63 percent in 2009 but would have expanded only 0.97 percent in 2010. The overall story remains the same, however these figures highlight just how important, in dollar terms, the state’s durable good manufacturing sector is to the state GDP numbers. Also included in the release was per capita real GDP figures for 2010, which are based on the 2010 decennial census counts. Given that the U.S. Census Bureau has not yet released intercensal state population estimates consistent with the 2000 and 2010 census counts, per capita real GDP figures are currently unvailable for all years from 2001 through 2009. However, per capita real GDP is available for 2000 and we can calculate the 10 year change across states. Oregon’s per capita real GDP grew 23.2 percent over the decade, which works out to a 2.10 percent annual growth rate (the annual number is smaller than the 10 year figure divided by 10 due to compounding). This growth ranks 5th best among all states plus the District of Columbia. During the same time period, the nation’s per capita real GDP grew just 6.7 percent, or 0.65 percent annually. While this topic is deserving of its own post, it is interesting to note that while Oregon’s per capita personal income has been declining relative to the nation (large PDF), the state’s economic output has been increasing relative to the nation. (Both the state and the nation are experiencing income growth, this refers to the relative growth rates.) This can be primarily attributable to the large dollar values associated with the state’s manufactured durable goods, which are incorporated in the state GDP figures but have not translated necessarily into higher personal income growth. In general, this is in-line with recent economic trends in which economic gains have been accruing to capital more so than labor (see HERE, for an example). Note 1: GDP by state is not explicitly the same as national GDP. GDP at the national level is calculated as the sum of spending by consumers, businesses and government on final goods and services (plus net exports). GDP by state is calculated as the sum of incomes earned by labor and capital and the costs incurred in the production of goods and services. In theory, calculating total economic activity through spending or through income should be exactly the same, however, given that different surveys and data sources are used, there is some discrepancy in the figures. Note 2: From the BEA release: The advance statistics of GDP by state for 2010 are based on a more limited set of source data and an abbreviated estimation methodology compared with the standard set of data and the estimation methodology used to prepare the revised NAICS statistics for 2007—2009. The advance GDP–by–state statistics are based primarily on earnings by industry data from BEA’s regional economic accounts, released March 23, 2011, and on advance GDP–by–industry data from BEA’s annual industry accounts, released April 26, 2011. Preliminary farm sector cash receipts data from the U.S. Department of Agriculture are incorporated in the agriculture, forestry, fishing, and hunting sector. Preliminary value of production and price data from the U.S. Department of the Interior and the U.S. Department of Energy are incorporated in the mining sector.